Who needs a court painter, sculptor, or wax model maker when you've got 64 million years of erosion working on your behalf? 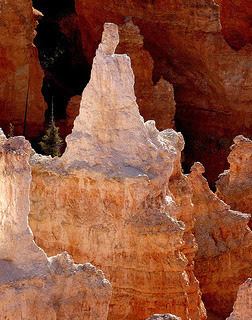 Shown here is the very famous Queen Victoria hoodoo in Bryce Canyon National Park in Utah. See her standing there, facing right, in crown and voluminous dress? This naturally occurring spire of soft, ancient limestone consists of sediments deposited by the repeated advancing and retreating of sea and lake over millions of years. It's the same material -- formed in exactly the same way -- used to build many of Britain's most beautiful stately homes and public buildings. "Bless the geology of Britain, in all its astonishing variety," says Clive Aslet in a recent Independent article on the use of limestone for building in Britain. "Owners of stone-built houses across the country inhabit a world unimaginably older than man." It's the same world inhabited by this naturally regal queen.